Power line Modem is a communication module (Also called as PLC Module) which sends data on the 230 Volt mains power lines. Power line communication module basically uses the existing power lines to transfer both AC power as well as data simultaneously. This form of communication is also known as power-line carrier, power-line digital subscriber line (PDSL), mains communication, power-line telecommunications, or power-line networking (PLN). PLC1762 Power Line modem can directly be interfaced to any of 8051, PIC, AVR or ARM microcontrollers. It can also be directly interfaced to Arduino and Raspberry pi. This is an easy to use plug and play power line communication module. No need for settings of any type just connects it to the mains, power it up and you are ready to go. The communication is quite simple and any serial data at 9600 bps can be easily transmitted via power line. The interfacing is also quite simple just connect your controllers Tx line to Modules Rx line and the controllers Rx line to the Modules Tx line and you are ready to go. No need of any settings or anything just a simple plug and play module. Normally the data transfer rate over power line is 100 bytes/Second (bps) i.e. though it takes data at 9600 bps from controller it can send data over the power line only at 100 bps. So when you are transmitting data serially please make sure the there is a delay of 5 ms after each byte. This Power Line Communication modem used FSK modulation technique with a center frequency of 72 Khz. 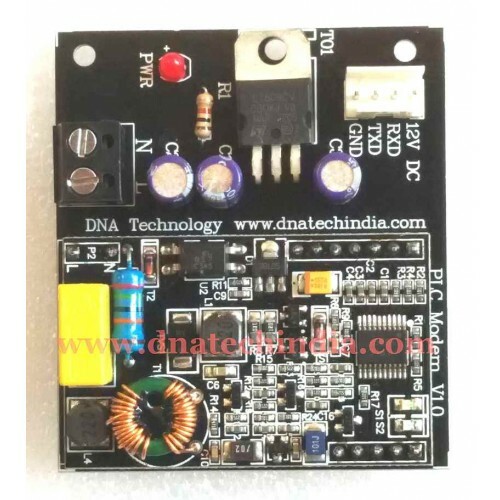 The module has onboard 5volt voltage regulator so you can provide external supply of 12-24 Volt DC. We recommend 12 volt supply.On board LED’s (S1 & S2) are also provided for debugging process. Communication in half duplex mode. Unix Connector Provided for easy screwing of power line cable. Relimate connector provided for easy interfacing with your circuit.